Bolstered by a classy sleepiness, 1980's Silent Scream is an undermentioned slasher from a chop-hack era that was quickly becoming focused more on splatter than character performances. Coastal college student Scotty Parker (Rebecca Balding) arrives on campus for the new school term but discovers that university housing is unable to provide her with a place to stay. The poor girl needs a room...badly. Scouring various local inns and hostels, Scotty finally finds a seemingly quiet boarding house by the beach. One of the tenants is a young woman named Doris Prichart (Juli Andelman), who directs Scotty to the strange young proprietor Mason Engels (Brad Rearden). Scotty is relieved to hear that Mason has two available rooms left. She allows fellow newcomer Peter Ransom (John Widelock) to take the more luxurious room and settles herself down to the modest (and cheaper) digs. Needing a place to store her luggage, Scotty stows them upstairs in the dusty house attic...and there bumps into Mrs. Engels, Mason's silently creepy mother (Yvonne De Carlo of TV's The Munsters). Soon, handsome neighbor Jack Towne (Steve Doubet) arrives and Scotty and her friends decide to take wealthy Peter up on his generous offer of a local dinner...unaware that someone is stirring in a boarded up section of the attic. Doris stealthily positions herself with Peter and sets up Jack and Scotty as a potential couple. After dinner and drinks, the four head back towards the house. Scotty and Jack are the first to arrive and they share a kiss before going to their respective rooms. Doris and Peter take an extended walk on the beach. Their time together is cut short when Doris has had enough of Peter's practical jokes and drunken behavior. She leaves him passed out near the water. When Peter awakens...he is surprised to find a person standing over him with a knife and he is savagely murdered. His body is then buried beneath the sand. Only a bloodied hand is visible. The corpse is discovered the next morning. Lt. Sandy McGiver (Cameron Mitchell) and Sgt. Manny Ruggin (Avery Schreiber) are assigned to the case. There were nine entry wounds on the deceased - and despite the fact that Peter spent his last few hours with his house mates, the officers don't get very far after questioning them. Meanwhile, Mason tells Lt. McGiver that his sister Victoria resided in the house before any boarders moved in and that she now lives back east. His father died before he was born. After the police have left, Mrs. Engels asks her son about what they wanted. "What do you think?" is Mason's terse reply. As a shrine to the father he never knew, Mason keeps his dad's military uniform and medals in a briefcase in his bedroom. Scotty and Jack go for a swim on the beach but the thought of Peter's murder puts a pall on their romantic afternoon. At the station house, Lt. McGiver is perplexed because they have no murder weapon, witnesses or motive. He tells the police chief (Jack Stryker) that he is "checking out" the Engels. In fact, his research reveals that sister Victoria had an incident when she was a high school student in the early '60s. Apparently, she had been jilted and she attacked both the guy and his new girlfriend with a knife. Things at the boarding house are getting more interesting. Scotty shares an intimate evening with Jack, while Doris is butchered in the basement laundry room. Victoria Engels (Barbara Steele), hidden away by her family, has never left! She takes the body and puts it in her closet - as a child would do with a doll. Scotty, who had seen Doris just before her murder, decides to check up on her friend after Jack has left. She doesn't notice the blood...but decides to do some snooping around the house. While going down a narrow corridor, Scotty finds Victoria's hiding place. Just as she approaches it, Victoria grabs her and pulls her in. Mrs. Engels, an enabler if there ever was one, helps to subdue Scotty. The young student tries to break free but she is no match for the two women. The commotion gets the attention of Jack, who can't figure out where it's coming from. Mason helps tie Scotty up but he is not exactly thrilled about the situation. "I don't know why you had to bring people into this house. I told you it was gonna be too dangerous and now look what she's done!" he yells at Mrs. Engels. And then the truth is revealed. Victoria is actually Mason's biological mother and she tried unsuccessfully to commit suicide during her pregnancy. The dead dad that Mason had idolized all these years was really his grandfather. During his investigation, Sgt. Ruggin has discovered that Victoria had been institutionalized for three years and lobotomized before her mother brought her home. He and Lt. McGiver head towards the Engels house. Proving that looniness is not isolated to the women in the family, Mason knocks Jack unconscious and then dresses up in his grandfather's military uniform. Armed with a pistol, he tries to shoot Victoria but instead kills his grandmother by accident during a struggle. Victoria grabs a knife from under her mattress and as she is about to stab Mason, he shoots her...before putting the gun under his chin and blowing his own brains out. Scotty manages to free herself. But a still very much alive Victoria threatens her with the knife. Jack, now back on his feet, tries to intervene. However, Scotty is resilient. She shoves Victoria towards a wall, impaling the knife into the woman's stomach. 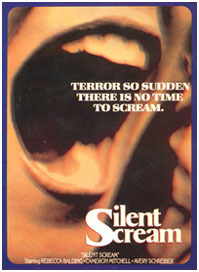 With its taut direction (courtesy of Denny Harris), a lush score from Roger Kellaway and a storyline containing a perilous family secret, Silent Scream is a nice tribute to Hitchcock's PSYCHO...with slasher leanings. Spunky Rebecca Balding, who had been wonderful as the wife of a gay man in TV's successful Soap, is terrific as Scotty. The actress would prove her mettle once again the following year in The Boogens. Of course, it's merely a valued bonus that genre queen Barbara Steele lends a doomed air as the tortured Victoria in Silent Scream. Long a horror icon, Steele made her mark in a variety of Italian terrors from the 1960s, including Mario Bava's gothic classic Black Sunday (1960) as well as The Horrible Dr. Hichcock (1962) and The Long Hair of Death (1964). Rounding out the cast is fellow genre lead Cameron Mitchell, terror flick regular with 1978's The Toolbox Murders and 1980's Without Warning. Certainly Silent Scream must rank as one of the better underplayed slashers from the early '80s, an atmospheric murderfest well served by its old school plotting, restrained pacing and atmospheric buildup. It's a solid effort worthy of appreciation.